Taken at pick 71 in the 2001, Brian Harris arrived at the Whitten Oval from Woodville West-Torrens and over time proved himself as one of the Bulldogs’ favourite sons. He made is AFL debut late in the 2002 season, and established himself as a regular at full back for the Dogs during the 2004 season. Harris eked out a place as one of the league’s elite key defenders between 2005 and 2007. Late in 2007 he changed his surname to that of his father’s and became Brian Lake. The change of name did not affect his form and he continued over the next three seasons to be a dominant full back, who read the play as well as any other defender in the AFL. Time and again Lake would be at the right place at the right time, marking strongly to repel an opposition attack. Lake feared no opponent and on several occasions easily had the better of superstar full forwards such as Lance Franklin and Jonathan Brown. His brilliance and consistency were rewarded with selection in the All Australian teams of 2009 and 2010. Injury cruelled Lake’s 2011 season and although he regained some of his best form in 2012, Lake decided at the end of that year to take advantage of his free-agency status and move to Hawthorn, with a specific aim of playing in a premiership team. Lake could not have planned, timed and executed his move any better. After missing early games in 2013 through injury, a slimmed-down and fitter Lake slotted into Hawthorn’s key defence position with ease in the second half of the season. 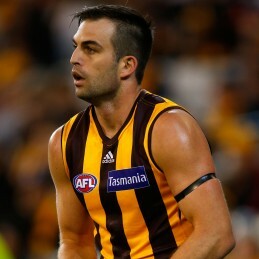 Winning the Norm Smith Medal in the Hawks’ 15-point Grand Final win over Fremantle, as he did, would surely have been enough to complete Brian Lake’s fairytale but he didn’t stop there, going on to add another two chapters to the story by being a vital part of Hawthorn’s 2014 and 2015 premierships as well. Brian has a natural witty personality and has proved extremely popular with the media and on the speaking circuit.